Bank erosion along the Matanuska River, a braided, glacial river in southcentral Alaska, has damaged or threatened houses, roadways, and public facilities for decades. Mapping of river geomorphology and bank characteristics for a 65-mile study area from the Matanuska Glacier to the river mouth provided erodibility information that was assessed along with 1949–2006 erosion to establish erosion hazard data. Braid plain margins were delineated from 1949, 1962, and 2006 orthophotographs to provide detailed measurements of erosion. Bank material and height and geomorphic features within the Matanuska River valley (primarily terraces and tributary fans) were mapped in a Geographic Information System (GIS) from orthophotographs and field observations to provide categories of erodibility and extent of the erodible corridor. The braid plain expanded 861 acres between 1949 and 2006. Erosion in the highest category ranged from 225 to 1,043 feet at reaches of bank an average of 0.5 mile long, affecting 8 percent of the banks but accounting for 64 percent of the erosion. Correlation of erosion to measurable predictor variables was limited to bank height and material. Streamflow statistics, such as peak streamflow or mean annual streamflow, were not clearly linked to erosion, which can occur during the prolonged period of summer high flows where channels are adjacent to an erodible braid plain margin. The historical braid plain, which includes vegetated braid plain bars and islands and active channels, was identified as the greatest riverine hazard area on the basis of its historical occupation. In 2006, the historical braid plain was an average of 15 years old, as determined from the estimated age of vegetation visible in orthophotographs. Bank erosion hazards at the braid plain margins can be mapped by combining bank material, bank height, and geomorphology data. Bedrock bluffs at least 10 feet high (31 percent of the braid plain margins) present no erosion hazard. At unconsolidated banks (63 percent of the braid plain margins), erosion hazards are great and the distinction in hazards between banks of varying height or geomorphology is slight. 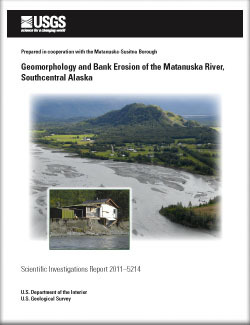 Curran, J.H., and McTeague, M.L., 2011, Geomorphology and bank erosion of the Matanuska River, southcentral Alaska: U.S. Geological Survey Scientific Investigations Report 2011–5214, 52 p.